AMD and NVIDIA totally dominate the market for discrete graphics cards - ones you plug into a motherboard for increased performance when playing games. The two companies are locked in a perennial battle for technology leadership at price points ranging from £40 through to £550. The previous two years has seen AMD eke out a small technology lead over its rival - AMD helped drive the adoption of Microsoft's DirectX11 graphics-related API in September 2009 with the release of the Radeon HD 5800-series cards - though NVIDIA's close relationship with games developers and, subjectively, a better all-round package has seen it keep at least a 50 percent share of the market. Both companies strive to have the fastest graphics card on the market, and the bragging rights that come from doing so provide a halo effect, where potential customers are drawn to the winning side through a mix of bombast marketing and word-of-mouth recommendations. That's the theory, anyway. At the start of the year, AMD's twin-GPU Radeon HD 5970 graphics card held a hotly-contested lead over NVIDIA's GeForce GTX 580 when evaluated over a broad range of games. Recently, AMD introduced the 6000-series graphics cards, delivering more performance than the previous generation on a launch-day price-to-price basis. A few days' ago, the company took two of its top-line Radeon HD 6900-series GPUs, placed them on one board, connected them together using established multi-GPU technology known as CrossFireX, and created the Radeon HD 6990. This £500-plus behemoth claims the title of the world's fastest graphics card with consummate ease. This TekSpek explains why. Looking back a little way to see how the Radeon HD 6990 has been constructed, AMD's very best single-GPU card - that's an add-in card with only one large graphics processor onboard - is the Radeon HD 6970, released in December 2010. Pulling up to 250W from your PSU, it provides premium performance for users who like to dial their image-quality settings to maximum, though it is been bested by NVIDIA's also-new GeForce GTX 580, released a month earlier. Graphics-card designers know that, realistically, the maximum amount of power that can be put through one board is some 450W, because, otherwise, cooling problems and power regulation start becoming insurmountable with traditional air-cooling. AMD's aim with the Radeon HD 6990 is to deliver as much performance as possible. Labouring the point, it does so by putting two Radeon HD 6900-class GPUs (known by the codename Cayman) on to one board, while keeping an eye on just how much power the card chews through when running at full speed. The simplest method of determining just how the dual-GPU monster has been architected is to look at a comparison table that highlights the technical specifications. The first aspect to note is that the Radeon HD 6990's two GPUs are functionally the same as a Radeon HD 6970's. Technically, this means the Cayman GPUs each have 1,536 processing cores, 96 texture units, 32 ROPs, and a 256-bit interface to 2GB of GDDR5 memory. Don't worry if this doesn't mean a whole heap to you; the point to understand here is that they're very powerful. But AMD cannot place two full-fat Radeon HD 6970 GPUs on to one board for the power and cooling reasons explained above, because this would cause the power and associated heat to spiral out of control. Rather, the two GPUs of the Radeon HD 6990, operating at 830MHz core and 5,000MHz memory, are clocked in at slightly slower speeds than a standard HD 6970, which runs at 880MHz core and 5,500MHz memory. By choosing the very finest Cayman GPUs, selected for their ability to run at high speeds with lower-than-normal power, AMD is able to keep the Radeon HD 6990 purring along with a maximum power-draw of 375W. Regulating the power is AMD's PowerTune technology, which dynamically adjusts frequencies if too much power is pulled, though its application is invisible to the user. However, each Radeon HD 6990 4GB card is outfitted with a switch enabling higher frequencies to be reached - defined by the left-hand column in the large table, above - by increasing the voltage to each GPU. Adding in more voltage increases the overall board power, up to 450W, and such is the demand on the components and cooling, that AMD and its partners do not warranty an 'OC' board should it fail. The upshot of harnessing two top-line Cayman GPUs on to one board is performance which is staggering. Evaluated at a 2,560x1,600-pixel resolution (very high-resolution gaming) and over six games, the Radeon HD 6990 is some 35 per cent faster than the Radeon HD 5970 and 56 per cent faster than NVIDIA's GeForce GTX 580. This is a graphics card that can drive any modern game at silly-high resolutions, and it only gets pushed when connected to three high-definition monitors through AMD's Eyefinity technology. Reinforcing the multi-monitor theme is the array of outputs on the card, composed of a dual-link DVI port and four mini-DisplayPort connections which, between them, can drive five displays from a single board. 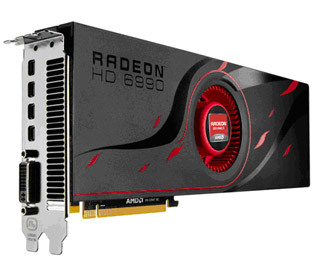 Incredibly fast and due to be AMD's best graphics card for the remainder of 2011, the £500-plus Radeon HD 6990 4GB's reign as the world's fastest consumer card may well be short-lived. NVIDIA is cooking up the also-dual-GPU GeForce GTX 590, rumoured to be composed of two conservatively-clocked GeForce GTX 580 GPUs, and it will be available, in limited quantities, in April 2011. The very high-end of the market has suddenly become far more interesting.